Alaska: Prince of Wales Timber Sale Decision Signed - The Supervisor for the Tongass National Forest has signed and released a Record of Decision (ROD) and Final Environmental Impact Statement (FEIS) for timber sales on the Thorne Bay Ranger District, Prince of Wales Island, Alaska. The announcement was made Thursday. The ROD for the Logjam FEIS, signed by Forest Supervisor Forrest Cole, explains and details the Selected Alternative (Alternative 5) from the Draft Environmental Impact Statement. These sales will support the Forest's 2008 Forest Plan Amendment and an Adaptive Management Strategy designed to meet the capacity of local mills to process timber in Southeast Alaska. The sales are entirely located in the roaded land base of the forest. The Selected Alternative will harvest timber over several years from about 3,400 acres of commercial forest land to produce 73 million board feet (MMBF) of sawlog and utility timber volume. The entire EIS project area covers a little more than 56,000 acres. The planned harvest will use a variety of methods designed to protect natural resources while economically harvesting the renewable timber resource. Logging systems will be mostly ground-based, with some helicopter logging involved. No Inventoried Roadless Areas will be entered with the implementation of the projects. The Decision also authorizes the construction of five miles of National Forest System (NFS) roads, and an additional 22 miles of temporary roads. There are about 125 miles of NFS roads and another 46 miles of decommissioned temporary roads within the project area. Quoting a Forest Service news release, the Logjam Timber Sales are a vital element of the local island economy and the Tongass' efforts to transition into a young-growth management strategy. Currently the Forest is working to develop enough timber under contract, with additional timber in planned sales, to supply local mill operators and the local wood products industry for the next 15 to 20 years. The Tongass will then transition its timber program to one that relies more on young growth timber from past harvest areas. The Southeast Alaska Conservation Council said in a news release, despite the fact that this area is more valuable for wildlife, hunting, fishing and recreational needs, SEACC along with other conservation groups offered a "Conservation Alternative " to help the Forest Service and area timber operators meet their timber needs. "Alternatives ranged from cutting no action to cutting 75 million board feet. Conservation groups came up with an alternative just under 40 million board feet that would create jobs and preserve wildlife corridors. So we're disappointed and a bit dismayed that the Forest Service would propose an unnecessarily high 72 million board feet alternative that cuts into one of the primary wildlife corridors on Prince of Wales," said Lindsey Ketchel, executive director of the Southeast Alaska Conservation Council. 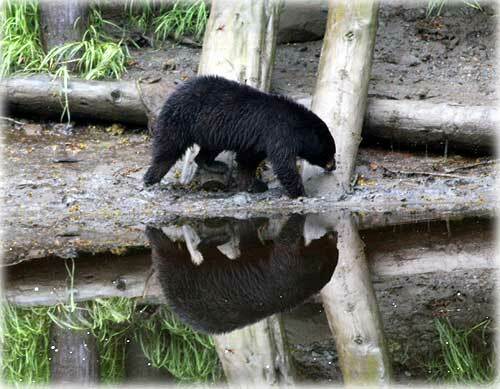 "It shows they want to continue business as usual on the Tongass." Alaska: Fifteenth Ethics Complaint Dismissed - The 15th ethics complaint filed against Governor Palin or one of her staff has been dismissed. The complaint, filed by Andree McLeod against Anchorage Office Director Kris Perry, alleged Perry used her official position for personal gain by traveling with the governor on three occasions. The complaint was filed even after Perry obtained an opinion from her ethics supervisor, Linda Perez. In the opinion, dated September 28, 2008, Perez concluded, "By officially staffing the governor, you will be providing a more efficient means for direct communication between the state and the governor. It is in the best interest of the state at this time to have a state employee provide that staff function to ensure that information is provided timely to the governor and any decisions, questions or directions relayed back to the state." Fish Factor: $50 million in stimulus funds for fish feed By LAINE WELCH - The U.S. is about to spend $50 million in stimulus money on fish food to help fish farmers hit by a 50% increase in feed prices last year. According to the Associated Press, the money could "provide algae to nourish clam and oyster larvae along the Pacific coast, fill the bellies of tilapia in Arizona and feed catfish, trout and game fish in the Midwest and South." Supporters say the money will help preserve jobs in areas hard hit by the recession and lacking other industries. No mention of where the farmed fish feed will come from - currently, most is generated from the catches of species like Peruvian anchovies or menhaden. Using ground up wild fish to feed farmed fish is a practice that is quickly falling out of favor. Let's hope that the feed purchasers will "go green" and "buy American" by sourcing some of that fish food from Alaska! Each year Alaska's fisheries produce an estimated 1.25 million metric tons of "industrial wastes" from fish processing operations across the state, much of which is turned into meals and oils for aquaculture operations. "It's the largest volume in North America," said Dr. Peter Bechtel, a USDA research leader at the Univ. of Alaska/Fairbanks. A 2008 study for the Anchorage-based Alaska Fisheries Development Foundation (AFDF) by Dr. Anthony Bimbo estimates Alaska's average fishmeal production at 217,000 tons from 2000-2007; there is no data available on production of salmon meal, and it is not known how much is sold domestically. Assuming a 5 year average price, Alaskan produced fish meal could have reached a value up to $170 million. Bimbo said it is difficult to quantify Alaska fish oil and meal production, because fisheries are divided between state and federal jurisdictions, and there are different databases. Alaska Science: Scientists discover track of soaring prehistoric creature By NED ROZELL - While hiking a hillside in Denali National Park last July, Steve Hasiotis bent down and picked up a rock. Its curious shape, like a plaster cast of a giant bird track, made him ponder the rock for a second before handing it to Tony Fiorillo. Fiorillo looked at it and confirmed they had found a missing piece of Alaska during the time of the dinosaurs. A pterosaur, like the one that left a track in Denali National Park, glides through the air about 70 million years ago. This image is cropped from a larger illustration by Karen Carr. "I said, 'This looks like a pterosaur handprint,'" said Fiorillo, of the Museum of Nature and Science in Dallas, Texas. "Because we knew they'd never been found before (in Alaska), we were pretty excited." 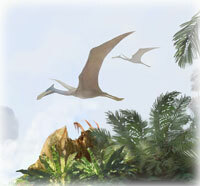 A pterosaur was a winged creature closely related to both crocodiles and dinosaurs. Seventy million years ago, it soared over Alaska like a giant albatross, casting a wide shadow beneath its 25-foot wingspan. The recent discovery by Hasiotis, Fiorillo, Yoshitsugu Kobayashi, and Susie Tomsich is the first record of a pterosaur from Alaska. The state has become a rich ground for paleontologists in the last few decades, with massive bone deposits off the Colville River and recent discoveries in Denali National Park. "The North Slope is cool, but the thing that's missing from the North Slope is that there's this great niche we know nothing about," Fiorillo said from Dallas recently. "In Denali, for the first time, we have an idea of what was in the air (70 million years ago)." Fiorillo, Hasiotis (from the University of Kansas), Kobayashi (from Hokkaido University Museum), and Tomsich (from the University of Alaska Fairbanks) co-authored a paper on the Denali pterosaur that appeared in a recent issue of the journal Palaios. The creature that left the impression of its hand off the Denali Park road was perhaps about 35 pounds, and glided over waterways with the occasional flap of its hang-glider wings. The pterosaur might have been a fish-eater, due to the large number of fish fossils found in Denali National Park, Fiorillo said. "It might have cruised over the top of the water like a bald eagle, or maybe a pelican," he said. "There's no modern analogue for these animals."